Institution staff members have an additional navigation item: Institution information. Staff members have the majority of the functionality available on this page as institution administrators. 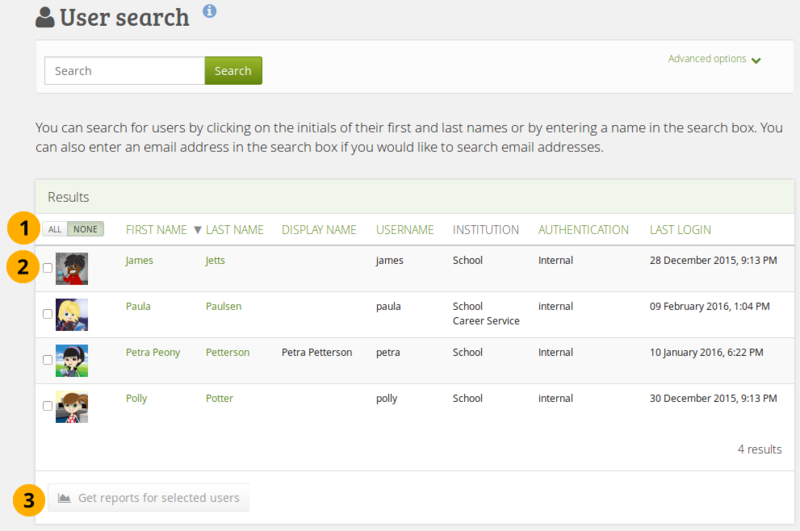 When you are on the User search page, you can view all members of your institution or just a select few. You only see the following options if you have the permission to access user reports. Staff members cannot manipulate user account information or access user pages to which they have not received direct access from the user. The reports page only lists the pages, but does not give default access. For more information on what you can see in this action, please refer to the section “User reports”. The functionality available to staff members is similar to the one for institution administrators as described in the administrator section on institution statistics if the site administrator allowed staff members to view the statistics.